We can ensure appropriate segregation of materials including hazardous substances such as asbestos containing materials and contaminated liquids and ensure appropriate reclamation and re-use of suitable materials. 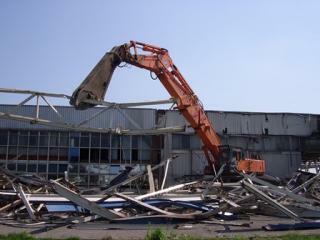 We can ensure demolition works are undertaken safely, with due regard to the environment and in a cost effective manner. Our experience spans single dwellings, petrol filling stations, chemical plants, water treatment facilities and large and complex former manufacturing sites. The effective management of demolition and the processing of reclaimed materials to engineering products can provide significant advantages to the remediation or construction phase of a project. We can demonstrate that by encompassing the demolition element within the remediation works we have provided significant saving to both overall cost and programme on projects large and small. Due to our extensive materials processing experience we also have the necessary skills and experience to develop and agree all required permits including site waste management plans. By encompassing and phasing demolition and remediation we can reduce costs and programme for enabling works and ensure that works are undertaken cost effectively. For a great example of where this worked most effectively see our case study for demolition and remediation of a site near London which was contaminated with Asbestos in soil, Radiological materials and hydrocarbons. The site was prepared in a phased manner alongside the developer for residential development. We also have experience of following poorly managed demolition projects that have adversely affected the remediation phase costs and programme. By involving VertaseFLI you can be ensured of well managed cost effective projects.